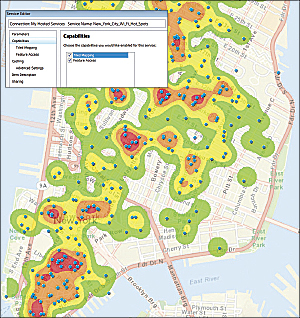 ArcGIS for Desktop users are crucial creators and publishers of GIS content to ArcGIS Online. Publishers control authoritative content, ensuring data accuracy and currency and quality of the organizational site. Publishing and sharing of web services exemplifies the collaborative power of the ArcGIS Online platform. 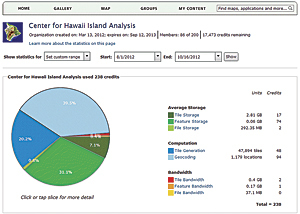 Monitor ArcGIS Online usage across the organization. With ArcGIS Online at 10.1, GIS professionals are presented with a ready-to-use cloud platform for supporting business solutions by enabling better communication and collaboration. ArcGIS Online works the way organizations work—supporting understanding and decision making by bringing together groups of key stakeholders and participants. At its core, ArcGIS Online is a full-featured system for organizing GIS projects and distributing maps, data, and tools, but its strength lies in giving users the ability to easily establish collaborative touch points with people—both inside and outside the organization—who need and will benefit from this information. The first step for organizations new to ArcGIS Online is to set up their ArcGIS Online account. This process is most likely handled by a GIS manager or other departmental lead, who will serve as administrator for the account. 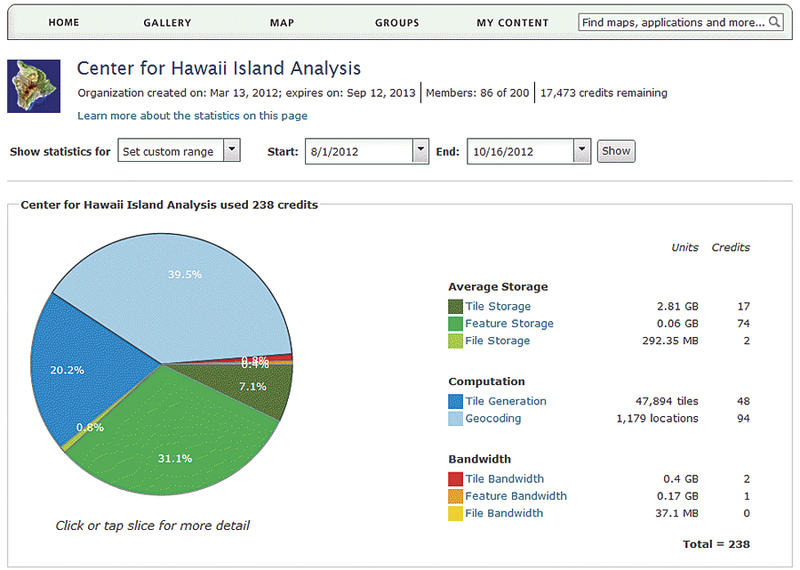 The administrator role involves customizing the ArcGIS Online home page and becoming familiar with the built-in dashboard that provides detailed reports about an organization's storage, computation, and bandwidth usage. Another key action taken by the ArcGIS Online administrator is to add users to the system. Administrators make sure that each new user is assigned one of three roles for interacting with ArcGIS Online. As mentioned, administrators manage the organizational site. They can also designate additional administrators. An administrator can add users—the decision makers, staff, and other essential viewers of the content provided through ArcGIS Online. Another role is that of publisher. Publishers are the content creators, the mapmakers and analysts who generate new content on a regular basis—namely, the ArcGIS for Desktop users and other trusted content producers. 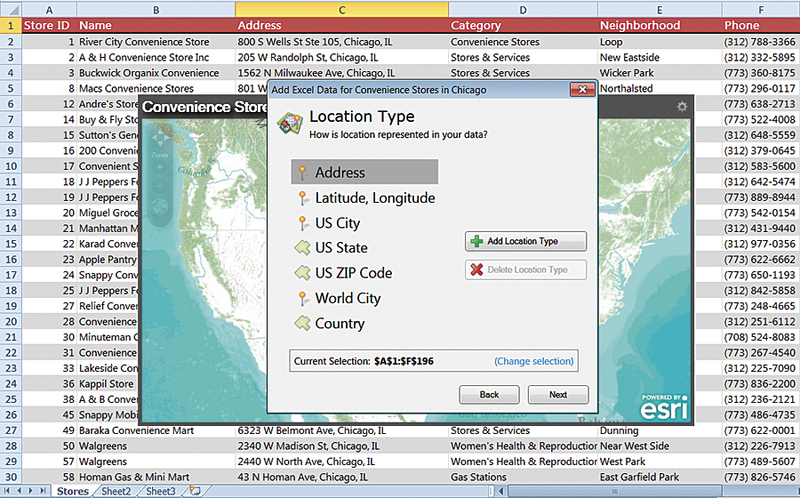 Publish hosted tiled map services directly from ArcGIS 10.1 for Desktop. Content production includes making maps using ArcGIS Online data and tools, adding data from a supported text file or other data format to maps, and making maps with Esri Maps for Office using Excel data. These are all basic tasks that can be performed by any user role and require nothing more than an ArcGIS Online subscription. 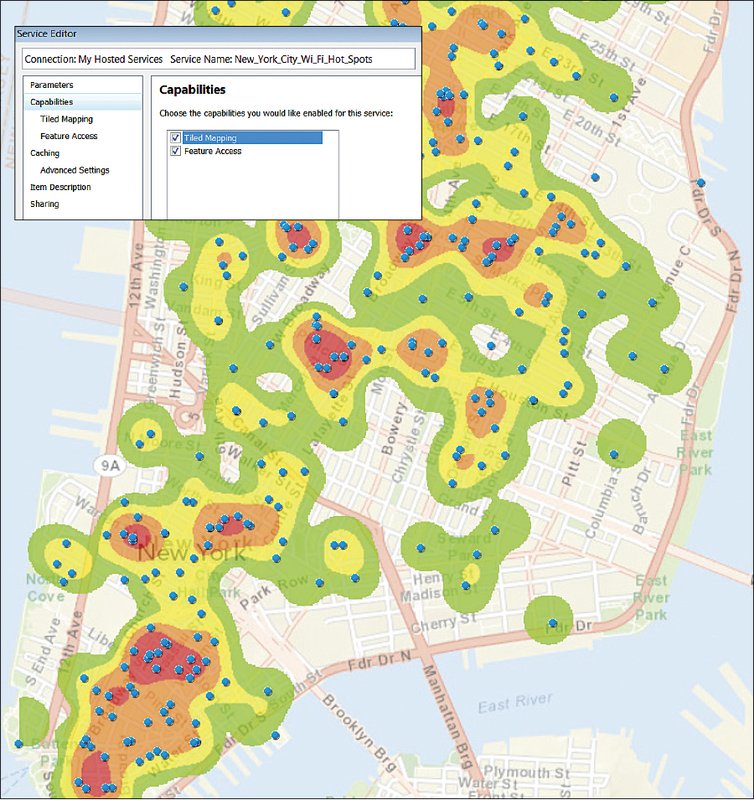 The publishing capability allows ArcGIS for Desktop users in particular to create web maps and other information products that can be accessed through browsers and mobile devices, as well as on the desktop. These products can be integrated with other systems, including Microsoft Office. Publishers control authoritative content, ensuring data accuracy, currency, and quality and, as a result, are critical contributors to the significance of the organizational site. For example, GIS analysts with publisher privileges will use ArcGIS Online as the product delivery platform for the work they do. As they collect or derive new information and geoenable it for use in mapping, they can publish these products and organize them on ArcGIS Online. Publishers have the unique ability to publish hosted services. There are two types: tiled map and feature services. Desktop users can publish both tiled map and feature services directly from ArcGIS 10.1 for Desktop. This gives the GIS analyst or specialist exceptional control over the quality and performance of web maps produced for the organization. To be sure, a publisher can publish hosted feature services (for end-user editing and querying) directly from ArcGIS Online, but once again, the publisher ensures content quality of products for the organization. Make dynamic maps directly in Excel and share them in ArcGIS Online. The publisher role also extends additional capabilities to ArcGIS users, particularly desktop users, by making it easier to collaborate with colleagues and business partners beyond ensuring the timely delivery of authoritative content to stakeholders and customers. The services created and then hosted on ArcGIS Online during the publishing process can be pulled back into ArcGIS for Desktop and used for further analysis and modification. This capability allows the GIS analyst to mine and repurpose corporate data, even hosted web services, using the full power of ArcGIS for Desktop. When the analysis is complete, the results can be published back to ArcGIS Online. This back and forth use (publishing and sharing) of web services exemplifies the collaborative power of the ArcGIS Online platform. GIS professionals can exchange ideas and processes through analysis. They can also use a common, accessible framework to generate and share alternatives and what-if scenarios with decision makers and other knowledge workers, no matter where they are. Additionally, ArcGIS Online makes it possible for publishers to create embeddable, interactive mapping products that can be placed in websites, blogs, and other social media venues. Any of the designated user roles can create a group on ArcGIS Online. A group is simply an organizational tool—a specific place—to categorize related or like items of content. 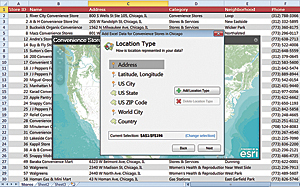 Both the ArcGIS Online group and the items contained in the group can be shared. This feature gives the content owner fine-grained control over who (inside and outside the organization) has access to the information. Departments and teams can share information and work on projects together, even if the team members live in different cities or countries. At 10.1, ArcGIS Online presents a new path that GIS professionals can take to advance mapping and GIS within their organization. It allows GIS departments—even small ones—to respond more proactively to the demand for GIS services by putting the necessary maps and applications in the hands of stakeholders while maintaining the integrity of spatial resources. See how simple the steps are for administering, publishing, and collaborating with ArcGIS Online. See also the ArcGIS 10.1 poster in this issue.